Do you happen to recognize this flag? The question was asked on the Wikipedia:Reference desk/Humanities [Read more speculation there]. 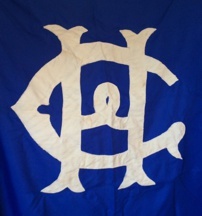 It looks home-made to me, so could be a family flag, or something unofficial. This almost looks like a Christian symbol to me. Are there any indications that it is even a flag? Maybe a wall hanging? Is this a flag? I only see a monogram or a cypher. It is absolutely impossible to pick up on this query if we do not include several details posted on the original message (#219595). For instance, in the message forwared originally by Mark Brader, he points out a question in a forum with the topic being "Reference desk/Humanities". When an occasional reader goes to look for clues on such a flag question, one can find that the list of subjetcts grows on a daily basis. So: if the message was originally sent on May 7, it should be noted on our entry so as to not get confused with subsequent questions on the same forum posted on the same thread. Also, the flag in question is taken from a Twitter account judging from its URL, but no Twitter account (nor tweet) is given, so we can start to look for it, its source, etc. Furthermore, when one clicks on the link provided there is no reference to a flag or banner in the text whatsoever. So, if we could please be a little bit more specific on the flag in question, it would help a great deal when trying to identify it. See here. Also, the flag in question is taken from a Twitter account ...by "tonyoconn1". Questions on the "Wikipedia:Reference_desk/Humanities" forum only remain there for about a week whether they are answered or not. The discussion thread is archived here, but since no real information is available on this one, I would suggest not worrying about it. By-the-way, "tonyoconn1" is Tony O'Connor, administrator of the Lloyd George Archive twitter account. Wording suggests that this account indeed publishes for the archive. First of all, I believe the image is upside down and backwards, see image #38a. Secondly, it has been haunting me that I recognize this monogram and I finally placed it, although I cannot find a version identical to the design details here. I'm pretty sure it is an antique version of the "word mark" of Holy Cross College in Worcester, Massachusetts. While today their mark is a "clean" sans-serif font shown on a purple background (#38b), I have seen other font styles on a dark blue in the latter part of the last century. 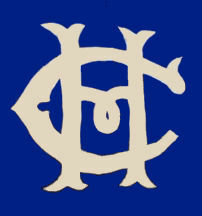 For the record, I briefly dated a young lady who attended Holy Cross and one of the three or so dates we went on was to a football game where hundreds of pennants with this logo on them were waving. My recollection is that the pennants were blue with the white cypher. Ah, upsidedown and backward, so that is what irked me in the image as it was. You also mentioned you were "pretty sure it is an antique version of the 'word mark' of Holy Cross College in Worcester, Massachusetts". I expect for a USAnian it would be easy to confirm that with the college. There are several CH entities that might have such a flag and might be related to Lloyd George's life, so we'd need to find the one that actually had exactly that cypher and indeed had such a relation. I have an old flag which is a purple cross on a dark blue background which I am told was flown by my great grandfather's shellfish shipping line Groom off the East Anglian coast. Do you have that one in your records or know where I should ask please? Purple and blue, or two shades of blue. It is quite unusual. I checked our collection of upright cross flags and we have nothing like it. I suspect the simplest explanation is probably the best one here - you reference your great grandfather's shellfish shipping line, Groom. Is there any reason to presume it is not related to that company? I do note that the flag looks a lot newer than the time of a great-grandfather. The field looks like it might be made of a bunting, but can you tell if the central cross is a nylon type of fabric? Have you had the hoist strip and clips replaced? These look new too. Well, it doesn't look like it's a formerly white cross post-laundering. So, really an unusual combination. Archives at Fishmongers' Hall? Shell-fishing is an East-Anglian thing, I guess, so local historical societies? Might be easier if Alistair would happen to know where Great Grandfather plied his trade. I have a cap badge that I found in a collection of pin badges. It's says H&B. M.Y.C. 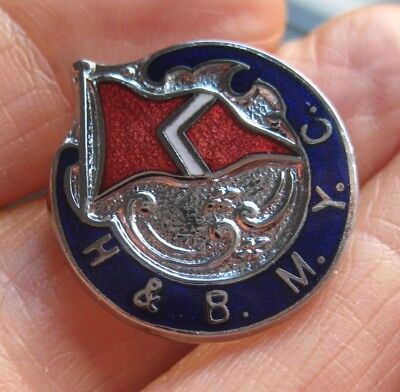 I can't find any marina or motor yacht club that would fit H&B. I also can't find any with that red burgee and white chevron. The cap badge has a registered design number stamped on it which I have established was registered in late 1913/early 1914 (but of course that's the design not the badge). It was also made by the well respected Thomas Fattorini. Any information you have would be appreciated. A possiblity here - could it be related to the Bayonne Yacht Club? This pin is seen here - Obverse (already attached) and Reverse (See original source). Notice that in the reverse, one can read its manufacturer, Bromfield Sports, (located in Shoreham by Sea, on West Sussex. I discovered another badge identical to this. The clue was on an image of the reverse of the badge, showing that it was made in Shoreham-by-Sea, Sussex (just outside Brighton). 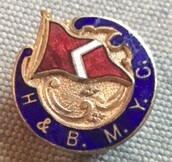 There was, in the early 20th century, a Hove and Brighton Model Yacht Club, and I suspect this was their burgee. 18-41. UFE from "The Lloyd George Archive"
Here is a flag from the "Lloyd George Archive Twitter Account" by Tony O'Connor. This flag is from this tweet published on May 18, 2018. 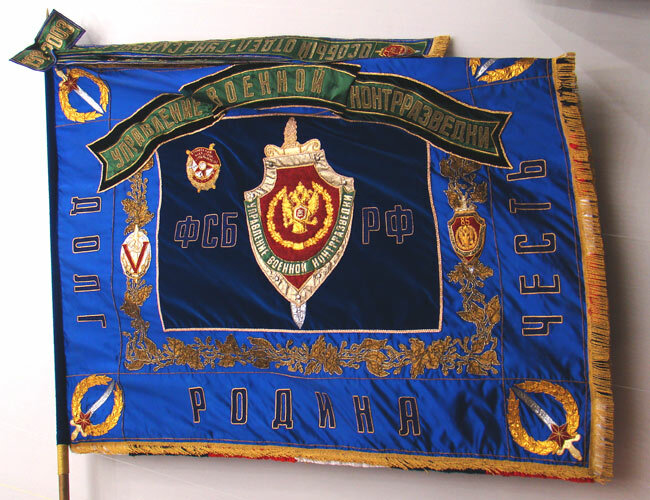 The picture caption reads: "An old banner/flag from our collection. Somewhat appropriate for this weekend!...Can anyone identify this flag?" 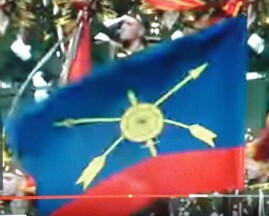 I'm attaching a pair of screenshots of the last Victory Day parade in Moscow (May 9). for your consideration. Their quality is not the best, for which I apologize. Maybe our friend Viktor can tell us whose flags are they. One is the Russian strategic missile troops flag and the other appears a regimental unit flag of the Navy. We can't identify the second photo. And nobody can do it. Because the photo is too small. 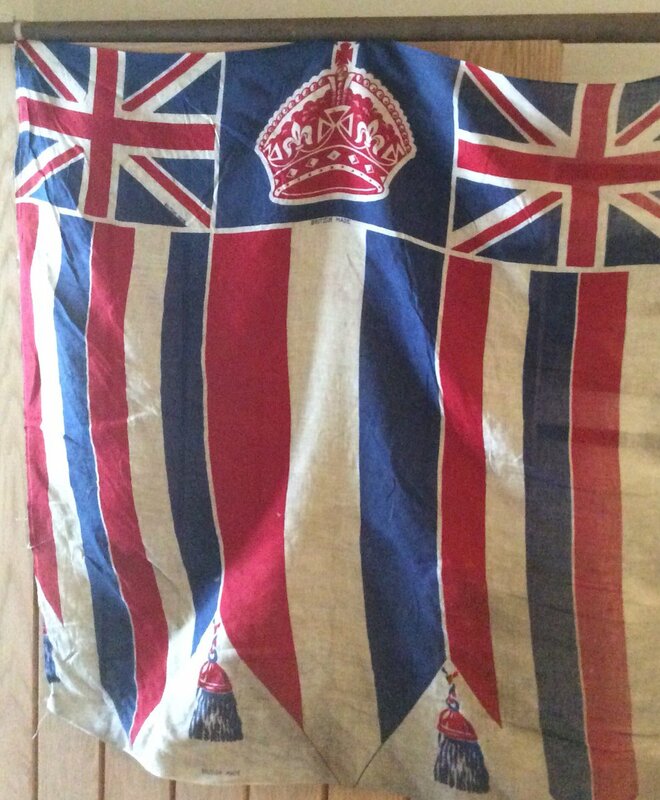 It may be a regimental flag, may be a division flag, or it may be the flag of some other military unit of the Navy or Navy School. All these flags are similar. They differ only in their central emblem. For example, see several flags at my Vexillographia page. - "61-я отдельная Киркенесская Краснознамённая бригада морской пехоты (61-я обрмп)" (61st Separate(Independent) Kirkenes Red Banner Marine Corps (61st Division), also known as 61st Naval Infantry Brigade). Given the 61st Naval Infantry Brigade's participation in recent events (i.e. Syrian Civil War for instance (source), one is lead to think that the Unit is being hailed for its merits in that particular conflict and I would go with this Unit as the one featured in Art Montreal's picture, in contrast with the 336th Independent Guards Bialystok Orders of Suvorov and Alexander Nevsky Naval Infantry Brigade. However, after watching the full video of the Parade, in which all of the Units display their flags (from 38:00 to 40:30 in the video), specifically the four mentioned above of naval origin, it is either one of them. 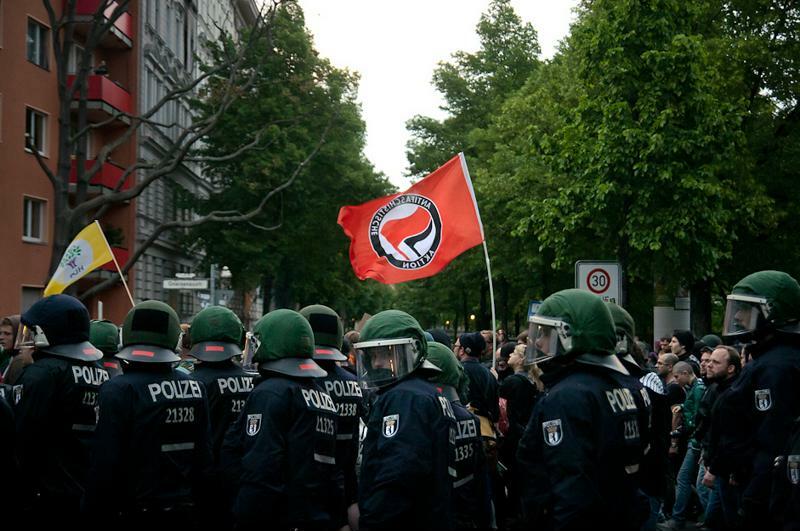 Does anybody recognize the flag on the left in this picture of the police taken at the Mayday Demonstration on 1 May 2014 in Berlin. The righthand flag is, of course, one of the Anti-Fascism Action (Antifaschistische Aktion) flags, but although the yellow one on the left seems familiar, but I can't recall it. The original name of this image was "MayDay2014AntifaschistischeAktionDemonstration.jpg" and it was tagged "#Mayday Berlin - Revolutionary demo" if this helps. The flag belongs to a Turkish political party, the Peoples' Democratic Party (Halklarin Demokratik Partisi - HDP). I wonder what it was doing at a German May Day Demonstration? That is a great page, by-the-way. HDP is a left-wing alternative party and a main opponent to the ruling parties AKP and CHP. There is a sizeable Turkish community in Germany. The May Day demonstration is a good opportunity to see several Turkish political flags, including those of organizations banned from Turkey. Manuela Schmöger contributed several reports on May Day demonstrations in Munich. This flag was found in an article by Raymond Ibrahim called "Islam's Impact on the West's Identity" in his weekly column "The Ugly Truth" (Front Page Magazine, 1 June 2018). 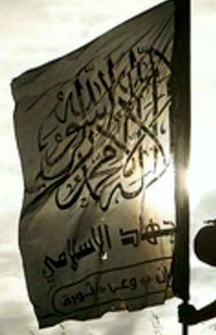 This flag displays the "Khatam an-Nabiyyin" (خاتم النبيين) Seal of the Prophets without the circular border and in black and white colors. 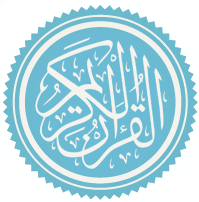 The Seal of the Prophets is a title used in the Qur'an to designate the prophet Muhammad. However the flag in question is used in the context of Islamic Extremism, more specifically in Jihadism (in general). The first used of this picture dates back to (at least) 2012 as this article and, again, given the context in which it is discussed, my take is that it is related to Isis, which at that time was starting to emerge. I found an old framed decorative flag in the attic of my old house about 20 years ago here in Iceland. I put it into storage and didn't think much about it. Was renovating the house and had enough on my hands. Looking for information about this using google reverse image search I found your page on War Ensign 1871-1919 which is the closes match I've found so far. 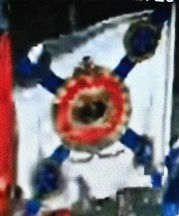 So if its not too much bother, could you shed any light on what this decorative flag is? I know its Germanic and naval due to the anchor, probably came from a ship that docked here in iceland I guess. Anyway thanks in advance and greetings from Iceland. I'm in a bit of a time crunch, but a few quick speculations here. It looks to me to be either Imperial German or even Prussian subnational. I base this speculation on a couple of factors. 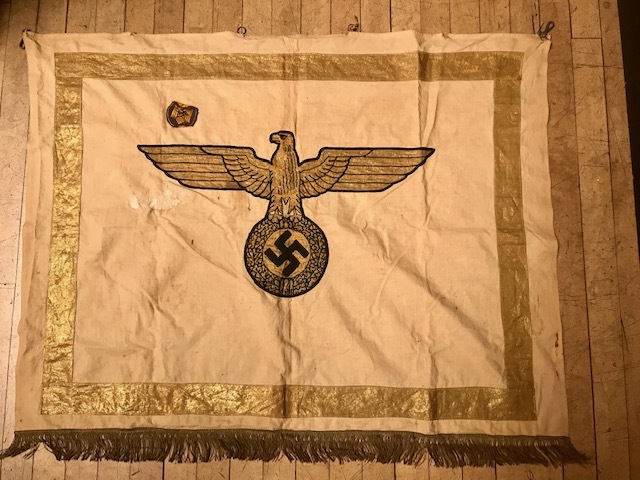 First there is the addition of the imperial crown and scarf (forget the German name) above the Reichsadler (Reich eagle), a variant similar to those used on ensigns such as German Imperial Service Flags and especially by the German foreign office. 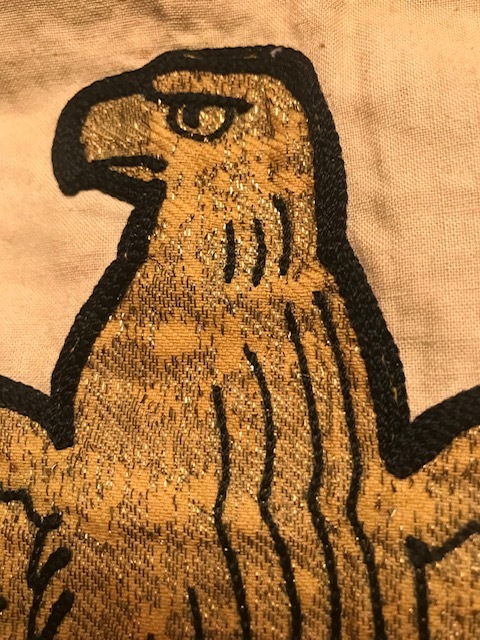 Then there is the shield on the chest of the eagle, very reminiscent of Prussian flags like those used on the Posen-West Frontier Province State Flag. Anyway, for those working on this project, perhaps these can be clues leading you in the right direction. Happy hunting. 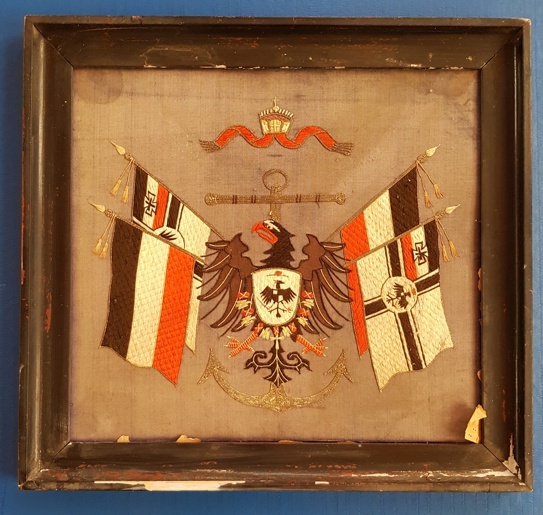 German imperial, definitely: the device in center is the Imperial arms superimposed on an anchor, and the flags at its sides are those of the Empire, not Prussia. Only the crown with infulae (not scarves) is moved upwards, atop the anchor, instead of being placed atop the Imperial eagle, and is depicted somewhat erroneously: the infulae are red instead of gold and the inside of crown is also red, as if having an inner red cap (which should be gold). The imperial eagle is bearing the royal arms of Prussia: silver shield charged with a black eagle, which bears the escutctheon of arms of the House of Hohenzollern - quarterly argent and sable. Consequently, no connections with the Posen-West Prussia Frontier Province. I agree with Toma, it is German Empire, depicted incorrectly but at least simplified, and twice showing the then German merchant ensign and the war ensign (Reichskriegsflagge). It might belong to a German naval association. Imperial. Prussia would be white and black. The tricolour was for Germany as a whole. However, is there a reason to call this a flag? It looks like cloth depicting flags and other imperial symbols to me, but there's nothing I see here that says that this is a flag. As I see it, we identified the flags on it, and that's probably all that there is to it. Unless we can date the flags more precisely, the rest of the puzzle is outside our field. The attached photo appeared on the Facebook page today. I thought it would be of interest. This is not a flag I know, but the symbol reminds me of two groups - the British Union of Fascists and the German American Bund Youth Unit. Any suggestions? This also resembles the flag of Integralist Party of Great Britain and Northern Ireland. But most of all, it looks as if someone drew a sig-rune shape with a felt-tip pen over the photo, presumably in order to cover a symbol they did not want to be recognized, or less likely, to add a missing symbol they wanted to be there (the disc looks rather vacant, minus the said shape). A restaurant in New Castle, DE, flies the flags of UK (17th/18th century version), Netherlands, and Sweden, the colonial powers that each controlled New Castle. The Swedish flag is a variant I have not seen elsewhere, with the Swedish royal three crowns in the canton (perhaps not the correct term in this case). Here is my reconstruction. I believe this is an adaptation of the tre kronor into a [hockey fan] flag. The recurrent use of the tre kronor is widely common on hockey team flags used in tournments, although there are no official flags for it. I specifically refered to some of the flag adaptations seen and discussed as part of the "Strange Flags at Hockey World Cup" (UFE 16-59) discussion (List message #211521). I further suggested in a previous message to the list (List message #211652) the inclusion of additional flags as part of the hockey tournament in which that version of the tre kronor flag was spotted. This item was discovered in a plastic bag, wrapped in a colonial flag of Jamaica. The flags belonged to my Father-In-Law now sadly deceased and we know he was a merchant seaman between 1953 and 1958. I can't quite decide whether it is a Maltese Cross or croix pattée on the pennon? I do not recognise this flag nor can I find it in some of the more obvious places in FOTW. 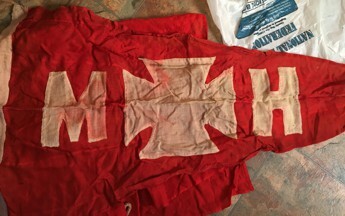 A pennant like this without the MH was used as part of the flag of Furness Houlder Argentine Lines, and the Forth Yacht Club in Scotland used the cross pattée in the 19th Century. This flag is the house flag of Moss Hutchinson Ltd, London. Interesting stuff, history. Unfortunately Russia's leaders are trying to hide and cover up the nasty aspects and instead want everybody to believe it was all honor and glory. I could translate the inscriptions as follows: above and in central arms "Command of Military Counter-intelligence", in orle: "Duty - Homeland - Honour". I hope that helps! It is for the Directorate of Military Intelligence - part of Federal Intelligence Service. The banner made in single instance. This type of flags was not adopted officially. I think it was made by veterans of the Directorate in about 90ths. Maybe as memorial banner... Now the banner is in the museum. 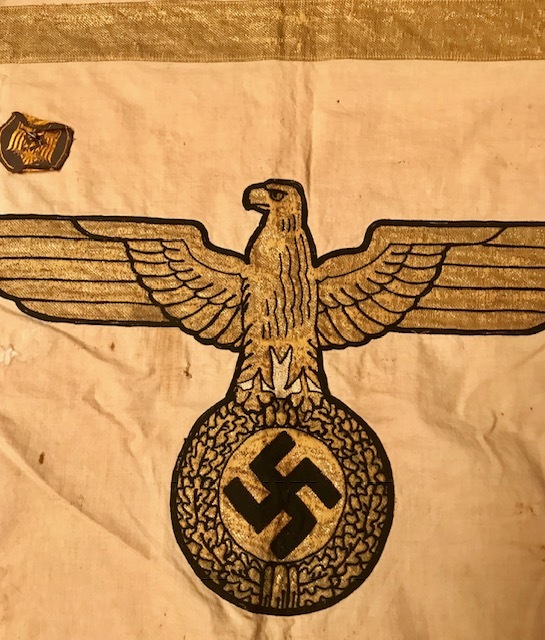 I wonder if you can help me identify a German signal flag from World War II. It was recently acquired by the Russian Arctic Convoy Project and we believe it once belonged to the u-boat U255. We are now trying to ascertain what it was used for. I have attached some photos. Any assistance would be greatly appreciated. At first I thought it was some sort of victory pennant judging from the shape of the item attached. However, after looking a bit deeper into other sources (source #1) and (source #2)it is perhaps a more educated guess to pinpoint this pennant as a German Signal Flag. Here's a picture (source) that shows the size of Victory Pennants by this boat, in contrast to another flag raised on its control tower, which definitely clears up the issue and discards the attached image as a Victory Pennant. This picture is also found here (original photograph) (source). 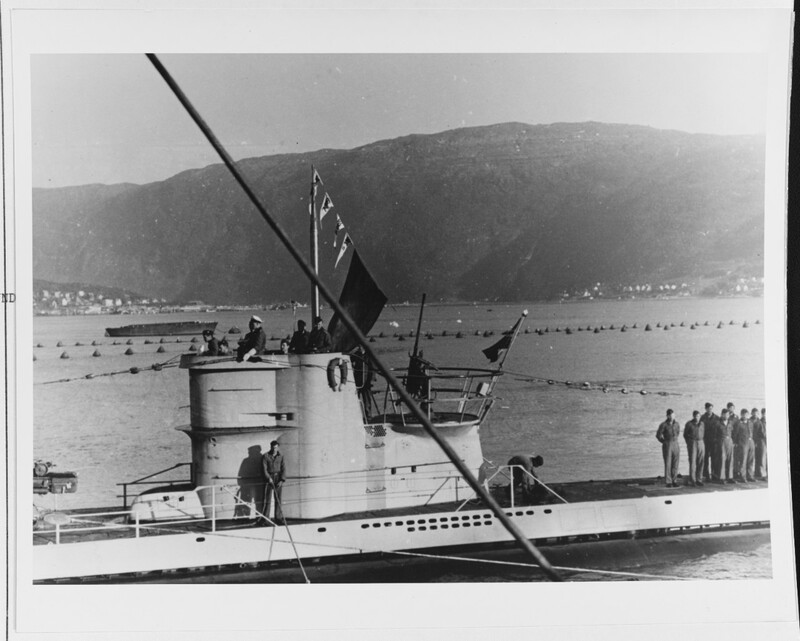 The caption reads: "U-boat crews aboard their craft, at Narvik, Norway, following the action against PQ-17, Flying the flag of one of their victims. This was a high scoring boat, credited with 30,000 tons sunk. Note 20mm gun on conning tower, raised periscope, and anti-torpedo nets in background. German wartime photographs." Again, the same picture is located here (source). 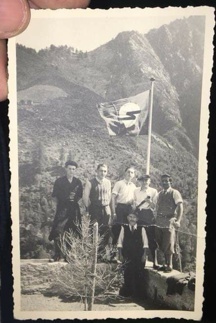 The Caption reads: "U-255 after the attacks on PQ 17, flying four victory pennants and the captured flag of the merchant ship SS Paulus Potter" (source #1) and (source #2). The Signal Flag that is most similar to the one attached, is the Number 2 on the German Signal Flag system. It is also similar to the ICS Number 3. Now the question is why this U-boat used (either) number. Perhaps denoting a sortie (mission) or the number of enemy boats attacked/sunk/hit? Or even maybe it is related to Convoy PQ-17? 18-51. Fictional Flag spotted in the 1965 Film "36 Hours"
I was watching the World War II film "36 Hours", in which the Germans try to trick an American officer into giving up the secrets of D-Day by convincing him that the war is over and the Allies won. The flag in question is that of the unified command of occupied Germany, it only appears in a few scenes and I've attached the best of the screen shots I could get. The logo on the flag also appears in several other places so I've included a shot of it face on. The film is black and white so the colors will have to be worked out. 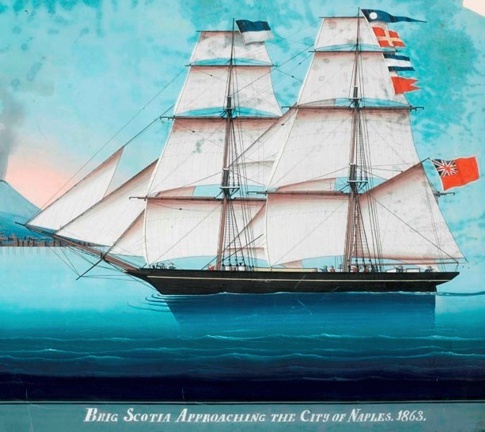 I am researching a watercolour in our collection: it's of the brig "Scotia" in the port of Naples in 1863. I have information from the dealer (which he took from Lloyd's Shipping Register, 1868) that the ship was registered in St. John's Newfoundland, and that it belonged to Punton & Munn. The flags are quite clear, and based on the Marine Trade flag manual that I consulted, it seems to me that the flags are identifiable by letter (4-signal, top to bottom: D, R, J, B). It looks like it has the British mercantile marine flag on the gaff. But I am so very not knowledgeable about interpreting such details (consulting the previously mentioned book, I took DRJB = hawser-laid rope), and would very much appreciate any help you think you could offer. I received this inquiry below from the Royal Ontario Museum. Can anyone provide any more information about this ship or flag sequence? The ship in the picture is 'making her number', ie identifying herself, according to Captain Marryat's Code of Signals for the Mercantile Service, the forerunner of the modern International Code of Signals. Under Marryat's code, the flags read, 2nd distinguishing pennant-7-2-5. 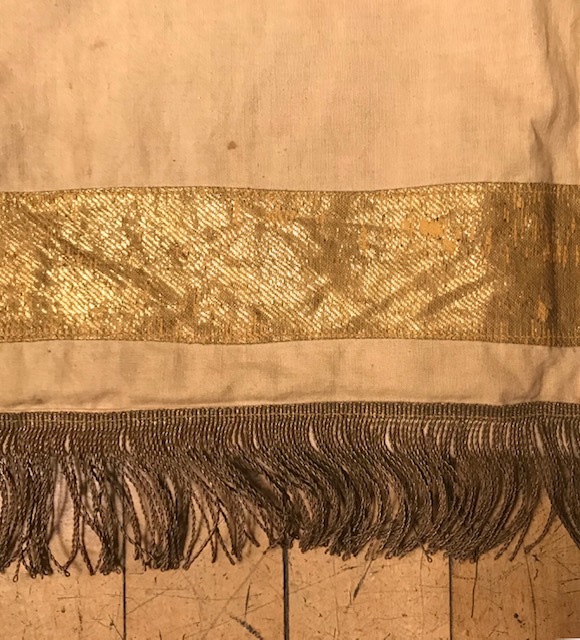 The 2nd distinguishing pennant merely identified which schedule of names in the Code was intended (there would be five such schedules eventually); 725 is listed as the Scotia, but there are no other details given as to which Scotia it could possibly be. The Red Ensign would be the appropriate ensign for a Canadian-registered ship in the early-mid 1860s, before the creation of a distinctive Canadian version. The blue over white flag on the foremast is probably that of the owner, but I have not been able to trace a similar flag in the material in our library. Having said that, information on such early house flags is very difficult to find. They are frequently shown as marginal illustrations to prints depicting individual ports, so it may be worth looking for such a print for St John's. We always appreciate your insight and knowledge! For further information, I have a chart of Signals made at the Port of Halifax, which provides a number of late 18th Century shipping line house flags. There is one blue over white bicolour, allocated to Pryor & Son. I have (of course) nothing to add to Ian's summary, however, Arlene may care to check the Dictionary of Vexillology's entry on "Marryar" where there is a link to the appropriate page of FOTW. 18-53. 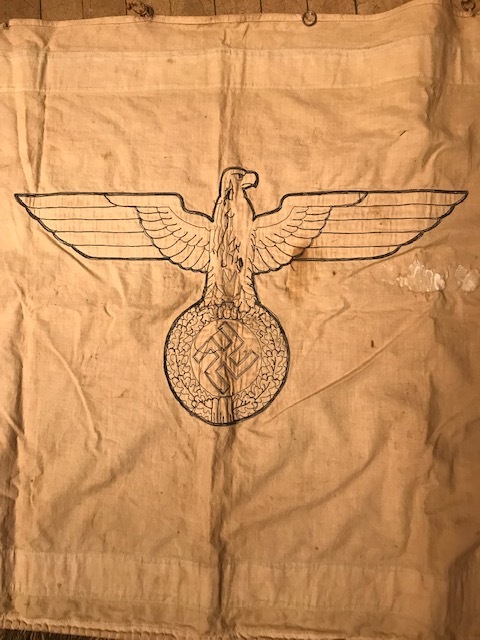 Early Ross-type flag image? I recently received the attached image along with the following explanation: "I recently aquired an late 1700s, early 1800s deer hide document box that has an interesting paper lining, with the Betsy Ross flag. Of course the first thought is the lining might have been added later 1800 after the Betsy story was trendy, but the print/paper seems to be late 1700 - grain, quality, shade of ink, the print in thebhinge area etc. I attached some pictures." My response was: "The so-called 'Betsy Ross' design was not associated with Elizabeth Griscomb Ross Ashburn Claypoole until after about 1876. She herself never made any claim on the record to having made this design flag or any other 13-star flag. The claim that she made the first Stars and Stripes in 1776 was made by her grandson, George Canby, in 1870. This followed some news accounts that Rebecca Young had made that claim as early as the 1840s or so and that her first flag claim was that Young made the first flag in 1777. However, at least one document from 1782 shows a flag very similar to your design, with more white stripes than red, except that it showed eight-pointed stars. I note with interest the bottom of the box has six-pointed stars. One feature of concern is the fact that the 5-pointed stars on the flag all point up. So far this feature has not been found on flags or flag images before the 1820s and even then it was very rare until the 1860s and later. My understanding is that paper manufacturing techniques had not changed much before the middle of the 19th century so the paper type could be contemporary to anytime before that. Having said all that, your guess is as good as mine." So your guess is certainly as good as mine. What do you think? My name is Paul Milbury of Military Historical Arms and Antiques in Globe, Arizona. I have had this, what I believe to be a podium banner, for a number of years now and just came across it as my wife and I are in the middle of "organizing". I'm hoping that you might be able to give it a proper identification. I see a similar silver one with a red background on your site and wonder if the gold color represents a higher ranking official? I will be happy to answer any questions and provide more pictures.